Please read this warning about satin lined blankies. This is an edited photo. The muzzle is white, and the color may be off somewhat. Jennifer is no longer looking, but Amanda is still looking for this blankie. 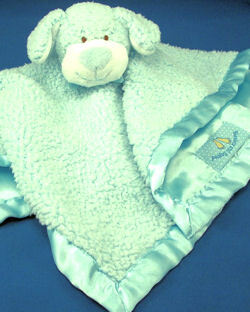 Prior to my son being born almost 2 years ago, we received a gift of this adorable “Blankets and Beyond” plush mint green puppy with satin trim and satin back. Over the last several months, my son has really began to love “puppy.” He is really struggling at daycare right now, and we want to purchase one to keep there, but it’s been so hard to find one. We are willing to purchase a blue one if necessary. Help! Ebay #310312377389 Blue priced well. Thanks so much, but no longer looking.